Description: This is a Dr. Strange marble that came in a set of custom marbles. Even though the images look vintage, this is a modern set. The person who makes these creates them to order on eBay from Canada. 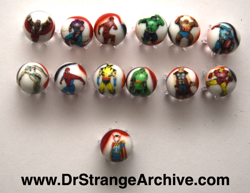 The rest of the set includes several other Marvel characters.